After Tom Schmid’s death in June of 1974, Titus was faced with the decision of naming a new leader for the company. But he also wanted to express to his children the hopes and dreams he and his wife, Doden, had for the future of their family. 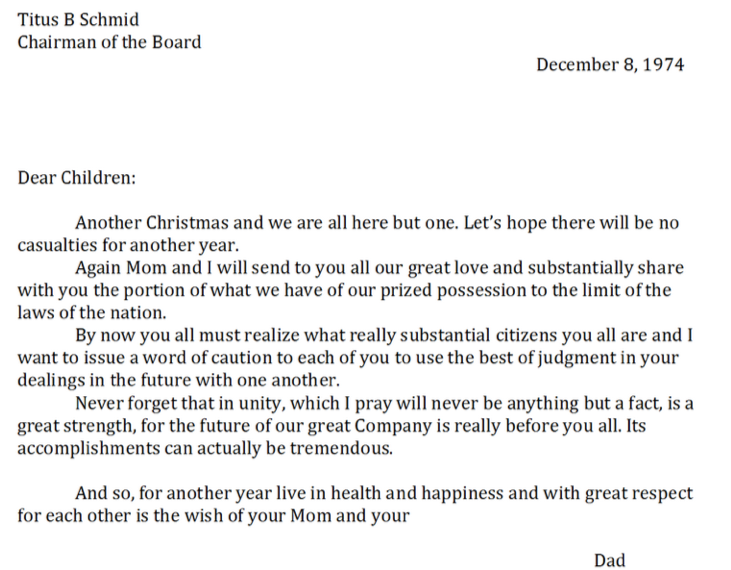 In December of 1974 Titus typed this heartfelt letter with a very touching message to his remaining children (Mary, John, Jim, Bill, Jeanne and Janet). This Christmas message captured for Titus the importance of keeping the family together. But Titus might not have bothered with this letter. The family already had a supportive family culture in place well before Tom’s death. In 2015 John Schmid describes what it was like to work with his brothers in the family business. And, at the end of this video is a snippet where Tom Schmid, at a family gathering in 1972, thanks his brothers and sisters, mother and father for all the love and support they provided each other over the years. Indeed, Tom expresses his hope that this family unity continues another “150 years”! 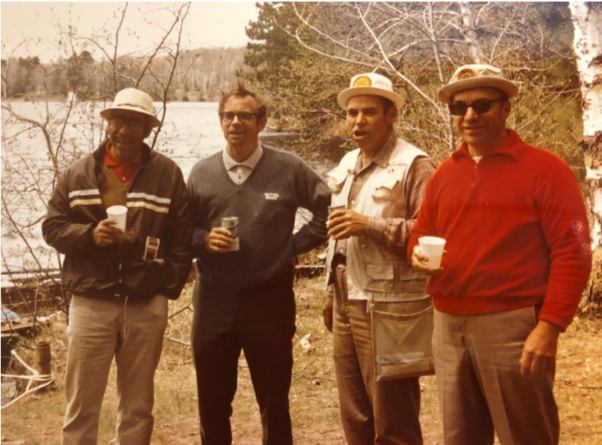 John, Bill, Tom and Jim on a fishing trip together in the late 60’s. The family that plays together stays together! 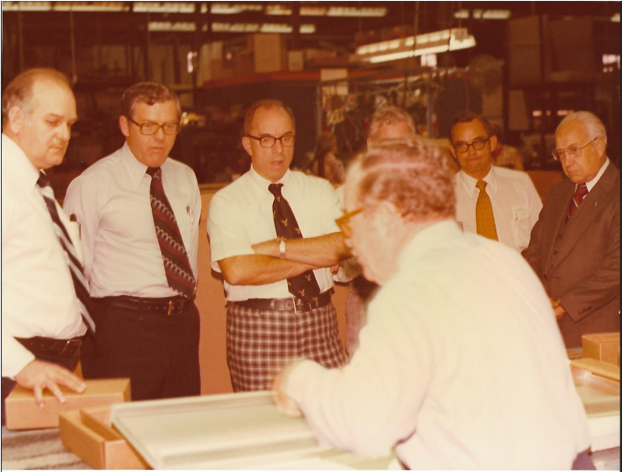 Jim became the President of Crescent Electric Supply Company in 1974, and like Tom before him, he exhibited leadership skills well before he was named to lead the company. 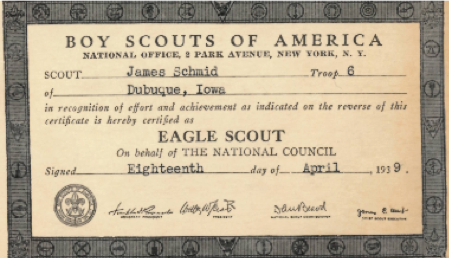 Jim earned the designation of Eagle Scout at age 16. 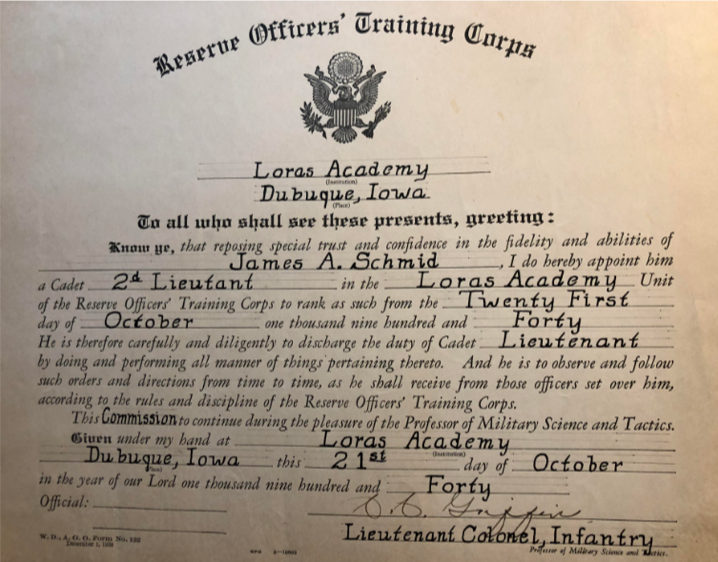 Jim excelled in his military training, earning Honors at Columbia Academy and the rank of Lieutenant at the Loras Academy Reserve Officer Training Corps. Jim also proved himself academically. We found report cards from his high school and college years. 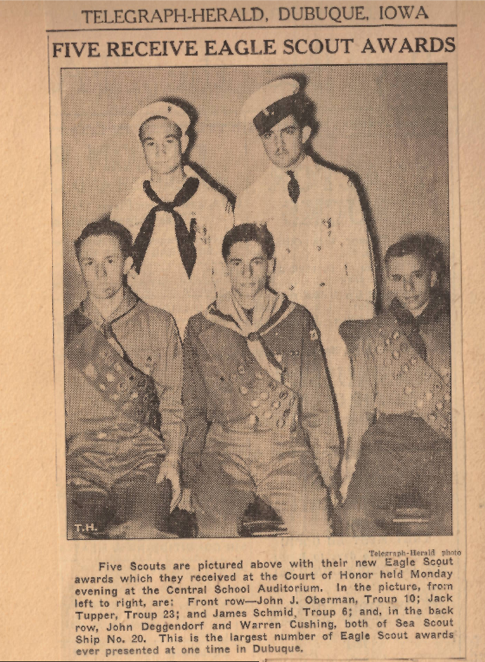 In the 1930’s grades in the 90 range were hard to come by! This photo from 1965 shows Jim smiling while pitching in to clean up the Crescent branch after the devasting flood in Dubuque. Like his siblings, he did whatever needed to be done to keep the business running. In the late 1960’s Jim, his brother Bill, and Don Schlader are captured in a photograph at a lighting demonstration. Jim was highly regarded by his siblings. In this video from 2006 his sister, Mary Christiansen, tells of her memories of Jim. In an interview in 2015 with John, Jim’s brother, John said: “Jim was the best thing that ever happened to Crescent”. Unfortunately, we don’t have a lot of photos or memorabilia from Jim’s years as president. What we do know is Jim worked hard to keep the business growing over the years he led Crescent, 1974-2001. Jim added many branches, and closed some as well, netting an additional 59 branches for a total of 117 branches in Crescent’s portfolio by 2001. - When Crescent purchased our company and Jim met with the employees he told us he could have come to our city, put up a building and stocked it, but he wouldn’t have us, the employees. He said the employees were the reason Crescent bought the business. I can’t quote it verbatim but I’ve never forgotten it. - If you were wearing a striped shirt, he would ask you what game you are referring today! - He always told us to have M&M’s on our desk for him to eat. - “You know you can use both sides of that adding machine tape. Reroll it and put it through to use the other side.” (Editor’s note: this same quote came from multiple people!). - Jim always liked his “Hershey chocolate kisses”. Once we moved to the new level he would come upstairs (even when he wasn’t well) and tell each of us good morning and help himself to a Hershey’s chocolate kiss. - Jim always said “Good morning Grumpy” to me. Not sure how I got that name! - If it was your birthday or work anniversary, he made it a point to personally congratulate you. That meant a lot to me! Lynn B. Fuller’s (“Butch”) was a business colleague of Jim. Butch wrote his memories of Jim Schmid based on Jim’s Board work with Butch’s family business, Heartland Financial USA, Inc., Dubuque, Iowa. “I always admired Jim as a builder of a company. In many respects, it’s both an easier and lower-risk strategy to sell a companythan it is continuing to compete, grow the company and adapt to the continuous changing environment and challenges that all businesses face. Growing a company takes both vision and the courage to venture forward. Jim, in growing Crescent Electric, was comfortable taking measured and prudent risks while at the same time keeping the company financially sound. As with all great leaders, Jim knew the importance of surrounding himself with top talent, and both empowering and trusting them as partners in growing Crescent to where it is today. (Editor’s note: appreciation of employees is a common theme in the Schmid family!). Jim was a real inspiration to both me and our company’s management team as we continued to grow Heartland. He was supportive and trusting in our ability to accomplish at Heartland what he and his management team had been able to accomplish at Crescent. Jim was excited to see Heartland grow and more than willing to lend not only his expertise but also to devote many hours to the company at board meetings, planning sessions, retreats, dinners and other events as a Director of the company. In fact, it was often said that Jim almost enjoyed his role and involvement with DB&T and Heartland as much or more as his role at Crescent. Jim had a lot of experience and success with mergers and acquisitions at Crescent, and he always enjoyed opportunities to discuss with me M&A opportunities for Heartland. Jim was very good at relating with people. He had strong inter-personal skills which are critical in the merger & acquisition business for making sellers feel comfortable and building the trust that a seller needs in a new partner. Jim was a great team player. He made you feel that he cared about you as a person, and not just an implement or tool to be used for the achievement of his personal goals or objectives. I have learned from my experience in the M&A business that the social issues in an acquisition are highly valued by a seller and, in many cases, if you can build a strong relationship based on trust, you don’t have to be the highest priced acquirer. Additionally, if you can develop those relationships ahead of time, transactions can be negotiated versus bid out. One of the things I learned from Jim that has been beneficial in my career is that he would invite staff, M&A prospects and customers into his home. (Editor’s note: we will see evidence of this hospitality in a later vignette) I have followed that same practice. I have found it really helps in developing a deep personal relationship with those individuals who are, in fact, your partners in business. Jim was big on cost control. He always said in a low-margin business, cost control is essential. He personally demonstrated his commitment to cost control by visibly recycling rubber bands and paper clips. I remember making a business call on Crescent Electric and sitting in Jim’s office when he showed me how he used scrap paper to write notes versus using a clean pad of paper. My guess is that Jim never promoted the use of 3M sticky tabs at Crescent! These are a couple of pictures that I treasure that bring back fond memories of our earlier years at Heartland. 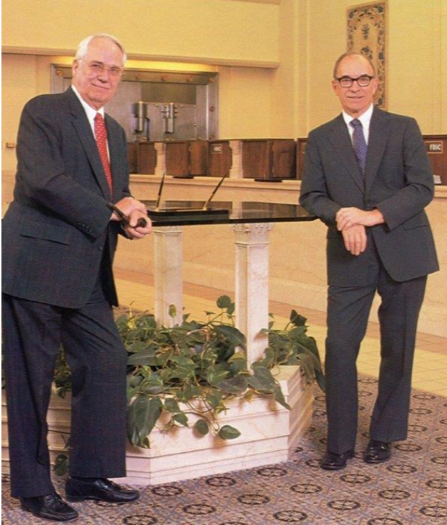 One is a picture of Jim and my father, Lynn S. “Bill” Fuller, in DB&T’s main bank lobby on 14th& Central in Dubuque, Iowa. The other picture is of three exceptional leaders: Jim Schmid, Bill Brown and my father. The three were best of friends and great business partners, all very successful individuals in their careers as CEOs and as business owners. They never flaunted their wealth, never acted arrogant -- but were both humble and empathetic. I felt very fortunate to have an opportunity to work with them as directors and leaders of our company. Jim’s started playing golf at a young age. This is a scorecard of a “Family Golf Match” between Titus and three of his four sons, Jim, Tom and John. John and Titus tied at 48 and Jim trailed them by 5 stokes. 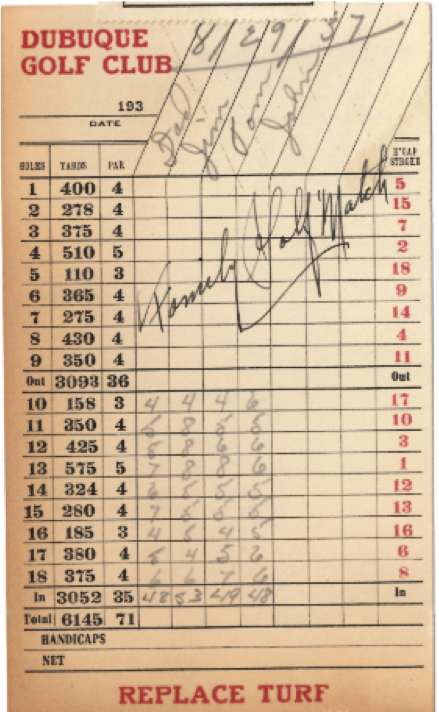 This golf match was in August, 1937 when Jim was 14 years old. We have photos of Jim playing golf with Titus when Jim was 18. While I won’t speculate on the outcome of that golf match the Schmid family photo book provided the caption, “Jim a little short of the cup.” Maybe this is why Jim always asked for a “gimme” on short puts! Jim’s love of golf was obvious to all who knew him. Kevin Neisen, Branch Manager for Crescent in Waterloo, shared a fun golf story about Jim. Kevin was at the Crescent East Dubuque General Office and ran into Jim. Jim asked Kevin about something business related. When Kevin answered Jim expressed a “less than happy" face. Kevin quickly changed the subject and said, "Jim you are my new hero". Jim looked at Kevin very puzzled. Kevin then said, "I hear you played Augusta National". Jim lit up and went on and on about playing there several times with Reggie Jones (CEO of GE before Jack Welch). Kevin said he had never seen Jim that excited! We have the opening remarks that Jim wrote for the Manager’s meeting in the fall of 2000 when he could not attend due to health reasons. Not surprisingly, he expresses great appreciation to the employees for their hard work and loyalty. ”This is a hard note to write as this is the first management meeting I have missed in 56 years. My health will keep me away this year but I did want to write and welcome you to Dubuque. A great many of you have been with the company for many years and I thank you most sincerely for that. The company is in excellent shape and that again is strictly due to the job you are doing in your respective cities. We have made many improvements again this past year and we will always do that. Our people programming the B2B business are doing an outstanding job. They will present what we have during the meeting, so make suggestions to them to improve this even more. Again, to the new people coming aboard, a big welcome and again thanks to you old timers who have built such a fine company. We have two outstanding people (Jim & Marty) leading the company now so give them the same support you have all given to me over the years. I will try to come over for a while during the cocktail hour to say hello. Everyone at the branch was sad to hear about the passing of your dad. There was no doubt that he was a great businessman. But more importantly, he was a good man. I was fortunate to be with your dad on some trips over the years, and he was just “one of the guys” unless you were putting! That is what I admired most about your dad, even though we were the employees, he treated us like friends, both the old-timers and the new people. Once again, we are sorry to hear about your dad, but you should be very proud of who he was and what he had accomplished in life. I wanted to express my condolences on Jim’s passing. I remember when he took the reins of our company after Tom’s death. Those were very difficult shoes to fill. Jim Schmid was held in very high esteem by his employees and the electrical industry. I remember difficult times of high unemployment and massive employee layoffs across the country. Jim kept a steady course through these times. Our branch did not have a single layoff, did not cut anyone’s hours, nor did we have to take any pay cuts. Pretty remarkable at that time! Not only was the course he held steady, but Crescent was able to grow. Jim continued to grow our company when others were being bought out. He made the decision to grow and we did. I feel a great sense of pride to have worked under Jim’s leadership and to have participated in this page of Crescent’s history. He will be greatly missed. This card and note are long overdue and they are sent with sympathy and many emotions. Your father once wrote me a note, which he did more often that I could imagine, and in it he wrote, “…it was a great day when we first met.” I have never forgot those words. …I feel joy and gratitude for having had the opportunity to know and spend time with Jim. Jim was so easy to be around and he respected everyone and had the unique ability to lift everyone’s self-esteem. He always made me feel better after talking with him…I have learned from him that without people our business is just mortar and boards. He glowed with character. Whenever I was around him I knew it was a special time…what pride I felt that he liked me! He always told me, “Craig, you have warmth but no class…”. So I leave you “with warmest regards”. 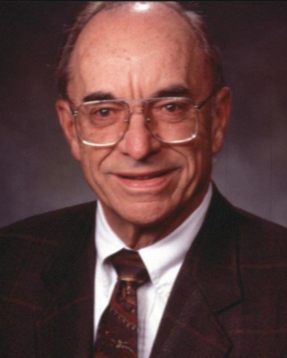 “The leadership Jim provided Crescent Electric Supply, and his personal contributions to NAED and the electrical industry over the years, have made, and will continue to make a lasting impact throughout the industry”. Jim was the President of Crescent but, or course, this was a family business and Jim’s two brothers, Bill and John, also had an important role to play in managing the business. Many of the major business decisions were discussed among the brothers before a final decision was made. John and Bill both started working full time (they all had worked at Crescent in various capacities while growing up!) in the Dubuque office. But after a few years they each moved elsewhere to gain more experience in the field. Bill started in Mason City, then in 1965 he moved to Waterloo to manage a handful of branches from that location. When Tom became ill, Bill moved back to Dubuque to help in the corporate office. John started off in sales and eventually located permanently in Davenport, where he stayed working until his retirement in 1994. Here is a photo of John at his Davenport, Iowa office (circa 1980). John Schmid in front of his portrait in the Boardroom at the corporate headquarters in East Dubuque, 1997. This is a picture of the Schmid family members working at Crescent headquarters in 1995. Three of the four next generation Schmid’s working in the company are picture here.